Above, the wings are mostly bluish grey with veins and all margins blackened. On the hindiwng, the bluish grey streaks in the cell form a narrow V with its apex pointing to the wing base. 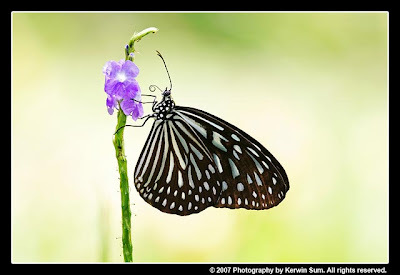 On the forewing, there is a transverse black bar towards the distal cell-end. 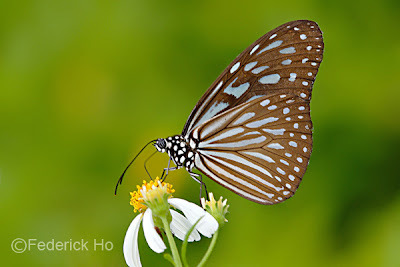 Underneath, the markings resemble those on the upperside but in lighter colour.The male has a distinct brand near the sub-tornal area of the hindwing. 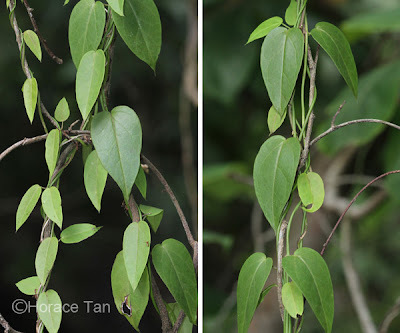 This species is locally common in Singapore and is most likely encountered in coastal mangrove habitats such as the Sungei Buloh Wetland Reserve and Pasir Ris Park. Occasionally the adults can also be spotted in some urban parks and gardens. Blue Glassy Tiger shares the same habitats with the similar-looking Dark Glassy Tiger (Parantica agleoides agleoides) and the two are difficult to tell apart when they are in flight. 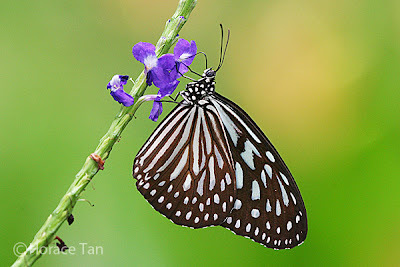 Once settled on a perch, Blue Glassy Tiger can be identified by the presence of the transverse bar in the forewing cell, a feature not present in the Dark Glassy Tiger. The sun-loving adults are slow and undulating in flight, and prefers open but sheltered environments. The local host plant is Tylophora flexuosa, a climber typically found in back mangrove habitats. 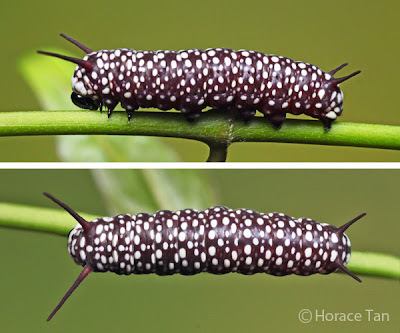 The caterpillars of Blue Glassy Tiger feed on the young and tender leaves in its early instars but move on to the more mature and larger leaves in later instars. Local host plant: Tylophora reflexuosa. 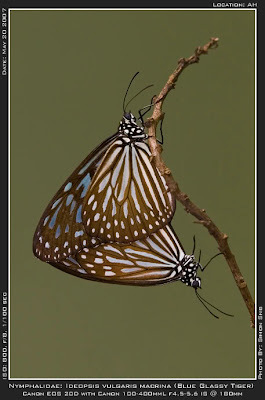 A mating pair of the Blue Glassy Tiger. 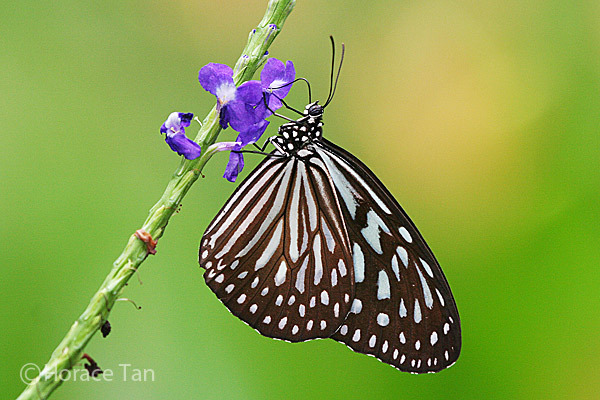 The eggs of the Blue Glassy Tiger are laid singly on young leaves or a slender stem of the host plant. The white egg resembles a rugby ball standing on one end (about 1.75mm in height). The egg surface is transverse ribbed and is adorned with shallow vertical ridges. Left: fresh egg; Right: mature egg. Note the black head is visible in the mature egg. The egg takes about 3 days to hatch. The young caterpillar emerges by eating away part of the egg shell. 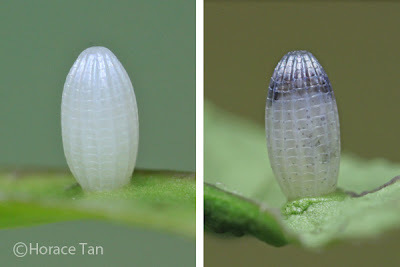 The rest of the egg shell becomes the first meal for the newly hatched which has a length of about 2.6-2.7mm. 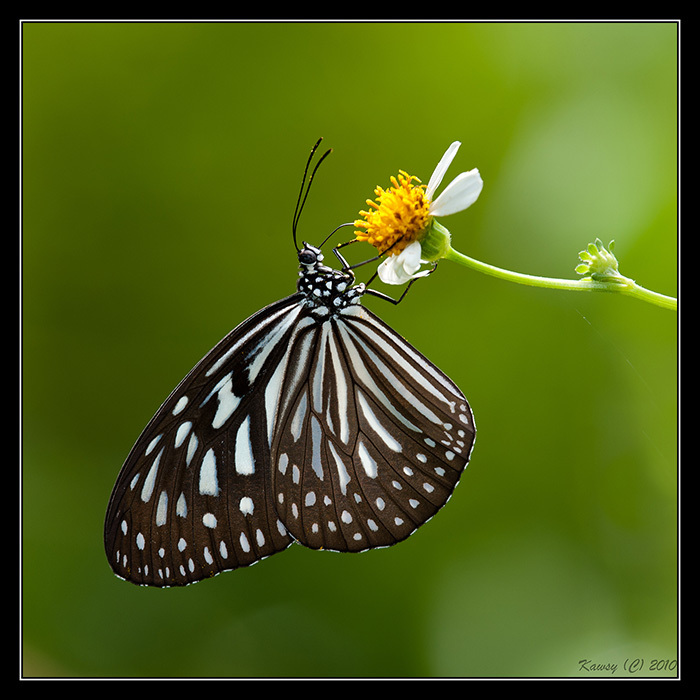 Its cylindrical body is whitish and has a fair number of short setae. The large head capsule is black in color. A pair of very short and pale brown protuberances can be found on the dorsum of the 2nd thoracic and the 8th abdominal segment. Another pair of small black dash-shaped patches are visible on the dorsum of the prothorax. All eight pairs of legs are black in colour and there is a large black patch at the posterior end. 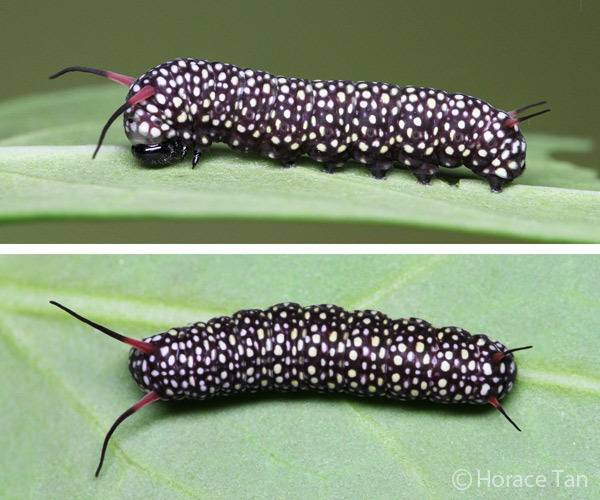 Two views of a newly hatched caterpillar, length: 2.3mm. 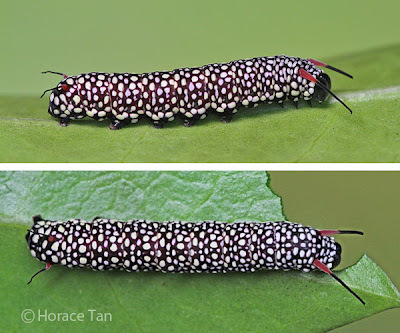 Once the newly hatched moves on to feed on the young leaves over the next few hours, its body starts to take on a wine red coloration, and numerous white oval-shaped markings appear. The two pairs of protuberances becomes wine-red in colour and are longer and projected outwards. 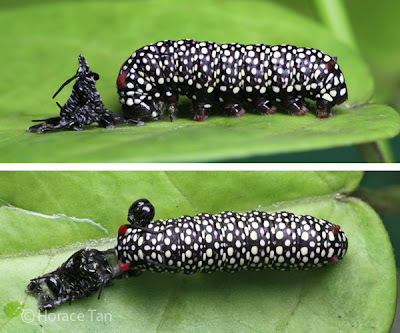 The growth is rather rapid with the body length about doubling in about 1-1.5 days, and after just 1.5 to 2 days from hatching, it moults to the 2nd instar. 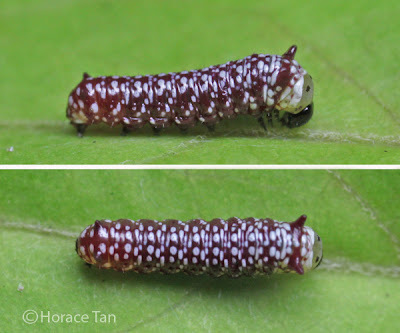 Two views of a 1st instar, late in this instar, length: 5.1mm. 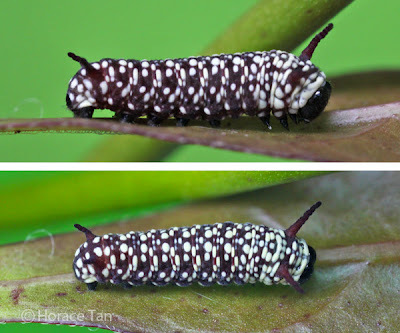 Two views of a 1st instar caterpillar, dormant before its moult, length: 4.5mm. 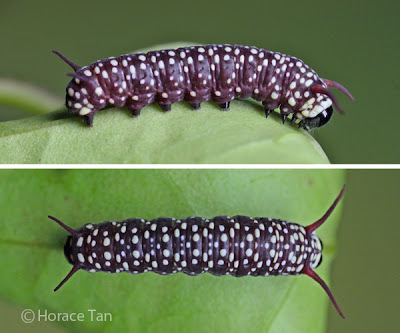 The body of the 2nd instar caterpillar is dark wine red to dark purplish brown in base colour, and is ornamented with numerous small white dots. The short protuberances on the 2nd thoracic and 8th abdominal segments in the 1st instar have become longer and fleshy processes with the pair on the mesothorax much longer. This instar lasts about 2 days with the body length reaching 7.5-8mm before the moult to the 3rd instar. 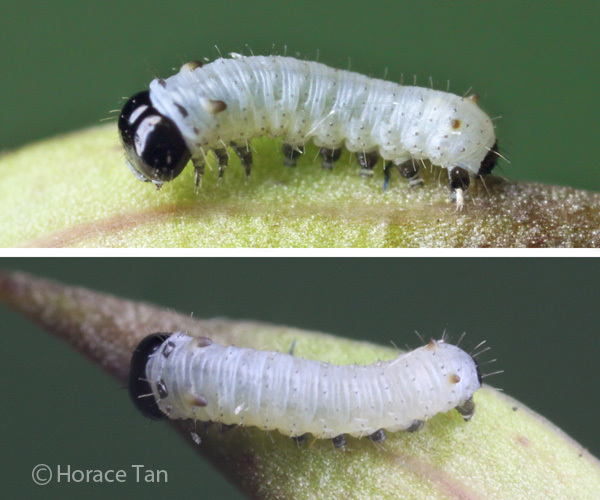 The 3rd instar caterpillar is similar in appearance to the 2nd instar caterpillar with the only change being the proportionally longer processes. This instar takes about 2 days to complete with body length reaching about 13-14mm. 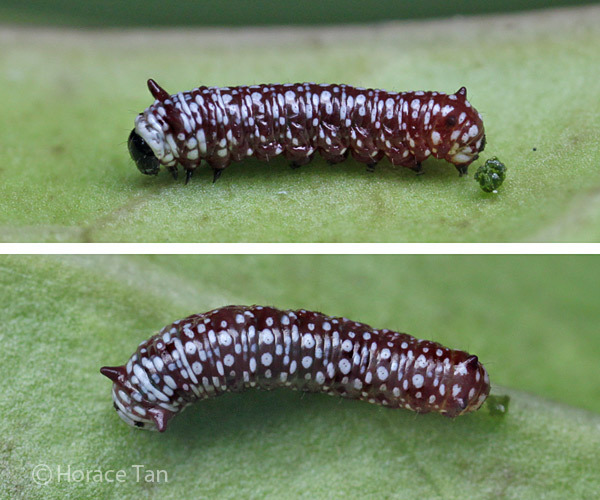 A newly moulted 3rd instar caterpillar next to its exuvia, it head capsule yet to fully turn black. 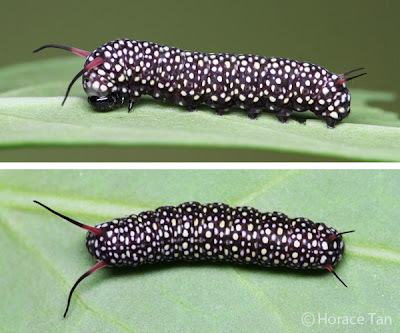 Retaining very much the same body features from the earlier two instars, the 4th instar caterpillar distinguishes itself in having proportionally longer processes, the meso-thoracic pair of which have the tendency to flex forward. The lower one-quarter of each of the four processes is coloured in dark red. 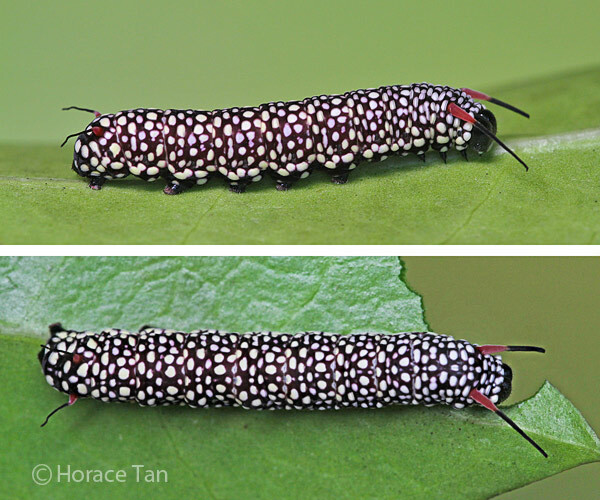 This instar lasts about 2 days with the body length reaching about 21-24mm. 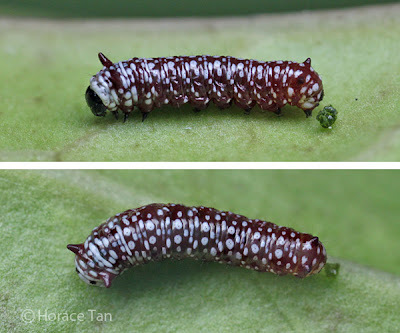 Two views of a 4th instar caterpillar, newly moulted, length: 13.5mm. Two views of a 4th instar caterpillar, length: 24mm. Two views of a 4th instar caterpillar, late in this stage, dormant before its moult, length: 21mm. The 5th and final instar resembles the 4th instar closely albeit with a noticeable increase in the size of the white spots which are thus packed closer to each other. A freshly moulted 5th instar caterpillar, with its exuvia trailing behind. Two views of a newly moulted 5h instar caterpillar, length: 21mm. 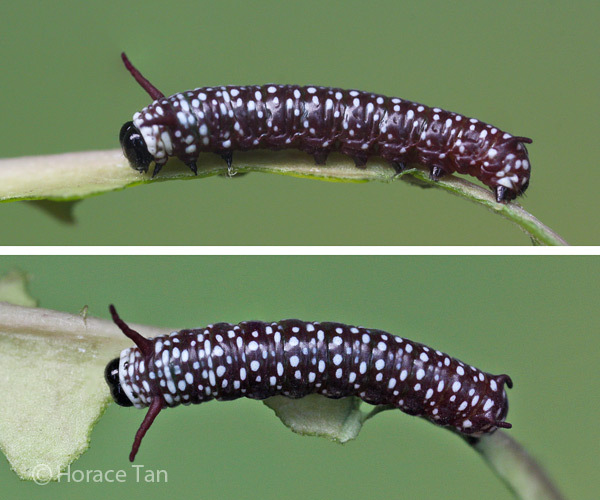 Two views of a 5th instar caterpillar, length: 31mm. The 5th instar lasts for about 3.5-4 days, and the body length reaches up to 34mm. On the last day, the caterpillar ceases feeding. Its body becomes shortened and the dark purplish brown base colour decolorises to a dark shade of grey, and the wine red colour in the basal part of the processess turns white. 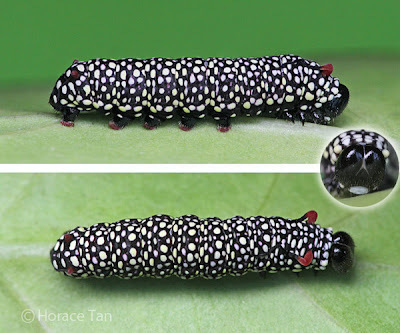 The fully grown caterpillar wanders around in search of a pupation site. Typically it comes to a halt on a branch/stem or a leaf underside, where the caterpillar spins a silk pad from which it next hangs vertically to take on the pre-pupatory pose. The body gradually takes on a yellowish tone during the pre-pupal stage. 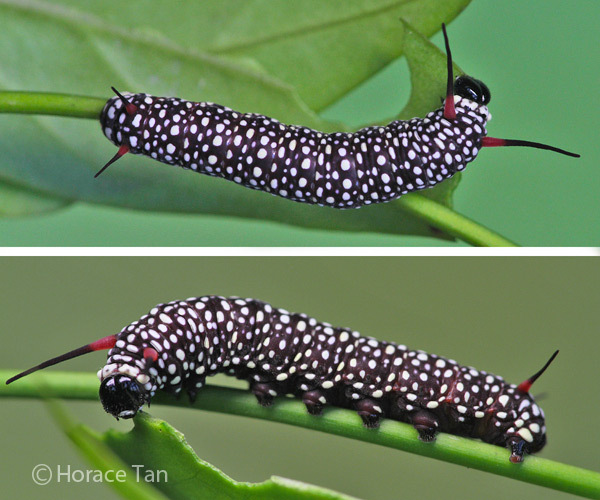 Within the few hours prior to pupation, the caterpillar gradually relaxes and lengthens to a straight posture. Waves of contraction soon travel from the the rear end to the head until the pupation event kicks in. 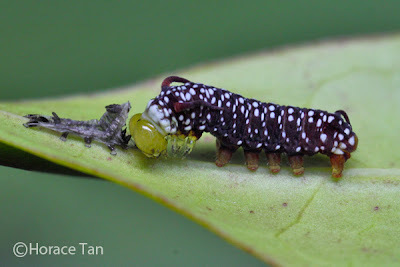 Pre-pupatory larva. 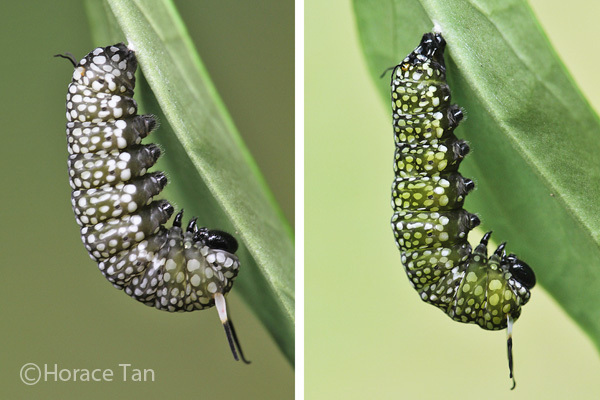 Left: early stage; Right: late stage with the onset of pupation only minutes away. 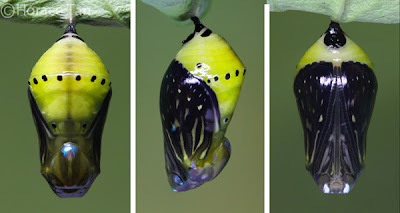 The pupation event of a Blue Glassy Tiger caterpillar. Pupation takes place about 0.5 days after the caterpillar assumes the hanging posture. 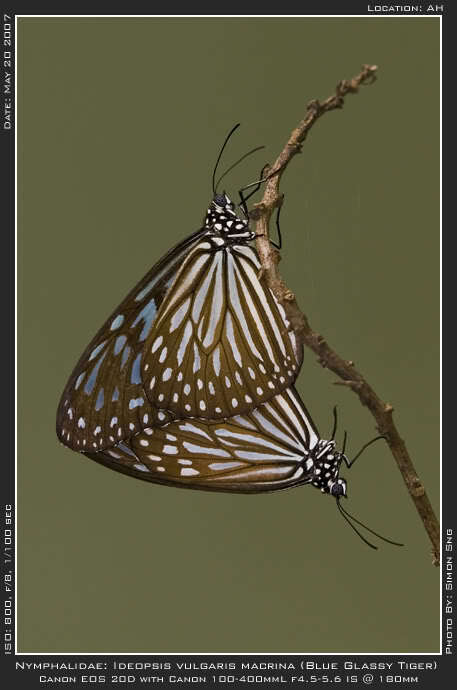 Typical of the pupae within the Nymphalidae family, the pupa of the Blue Glassy Tiger suspends itself from the silk pad with no supporting silk girdle. The pupa is bright yellowish green and is somewhat barrel-shaped. It has a median transverse whitish line marked with a series of black spots. 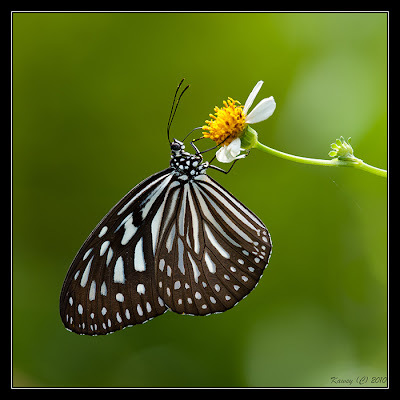 Several scattered silvery spots adorns the dorsum of the thorax and the wing pads. Two thick black streaks lie close to the black cremaster on the dorsal side. 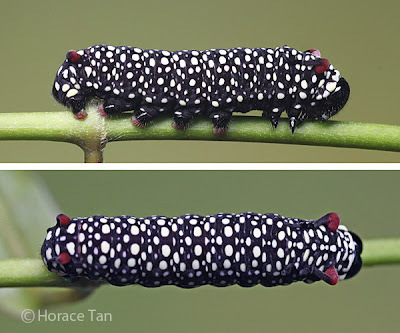 Length of pupae: 18-20mm. Three views of a pupa of the Blue Glassy Tiger. Three views of a mature pupa of the Blue Glassy Tiger. The pale streaks and some of the spots can be seen in the wing pad area. 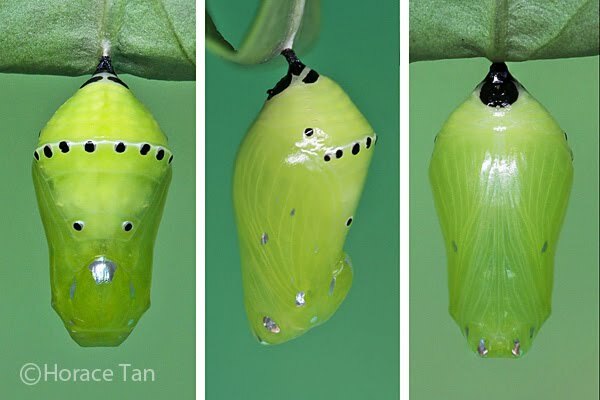 After about 7 days of development, the pupal skin turns translucent as the development within the pupal case comes to an end. 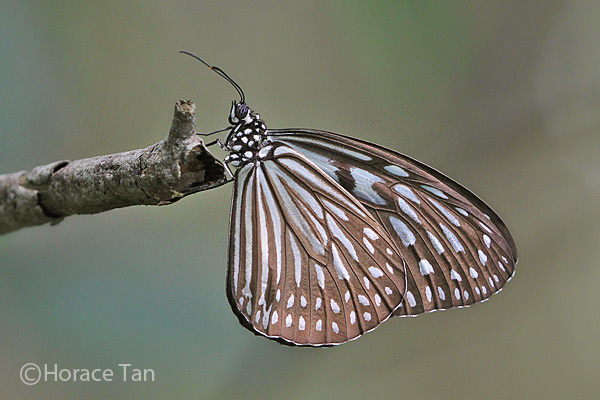 The spots/streaks on the forewing upperside also become discernible. 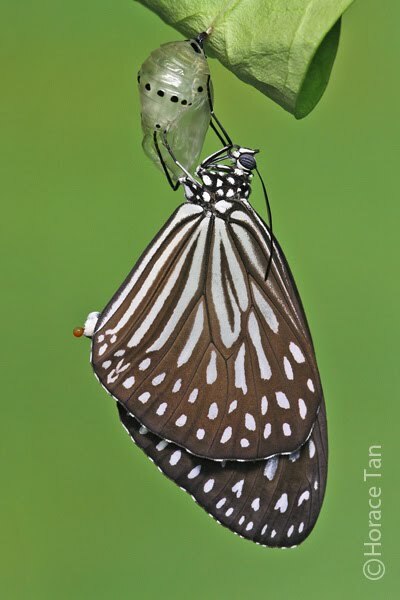 The following day, the adult butterfly emerges from the pupal case. It then perches nearby to expand and dry its wings before taking its first flight. A newly eclosed Blue Glassy Tiger drying its wings while clinging onto its pupal case.